The Collecta today is at St. Mary ad Martyres which is the name given to the beautiful Pantheon of Agrippa when it was turned into a Christian Church by Pope Boniface IV(608-15). The Romans of the Middle Ages loved this majestic sanctuary, where among other relics was preserved in a casket locked with thirteen keys the image of the Holy Face. Station at St. Lawrence in Lucina. Lucina was a matron living in the time of Pope Marcellus (304-9) who placed her houses in the Via Lata at the disposal of the ecclesiastical authorities; these erected there the titulus Marcelli, and, when the church was confiscated, built another not far off, in Lucina. Pope Celestine III placed under the altar a large piece of the gridiron on which St. Lawrence was martyred. The Liturgy now becomes permeated with the thought of Baptism. After hearing of the water gushing from the rock in the desert, we now read in the Gospel (St. John 4: 5-42) of the living water which Our Lord promised to the Samaritan woman. This second scriptural scene was also familiar to the faithful as a type of the sacrament of Baptism, and we see it, represented as early as the second century in the cemetery of Prutextatus. Grant me, O Lord, a proof of Your favor, that my enemies may see, to their confusion, that You, O Lord, have helped me and comforted me. Ps 85:1 Incline Your ear, O Lord; answer me, for I am afflicted and poor. V. Glory be to the Father, and to the Son, and to the Holy Ghost. R. As it was in the beginning, is now, and ever shall be, world without end. Amen. Grant me, O Lord, a proof of Your favor, that my enemies may see, to their confusion, that You, O Lord, have helped me and comforted me. O Lord, graciously be with us during this fast, and, we beseech You, help our spirit to abstain from sin as our body fasts from food. Through Jesus Christ our Lord, Who liveth and reigneth with Thee in the unity of the Holy Ghost, one God Forever and ever. R.Amen. EPISTLE Num 20:1, 3; 6-13. In those days, the Israelites held a council against Moses and Aaron. The people contended, exclaiming, Give us water that we may drink. But Moses and Aaron went away from the assembly to the entrance of the Meeting Tent, where they fell prostrate. They cried to the Lord, and said, O Lord God, hear the cry of this people, and open to them Your treasure, a fountain of living water, that being satisfied, they may cease to murmur. Then the glory of the Lord appeared to them, and the Lord said to Moses, Take the staff and assemble the community, you and your brother Aaron, and in their presence order the rock to yield its waters. From the rock you shall bring forth water for the community and their livestock to drink. So Moses took the staff from its place before the Lord, as he was ordered. He and Aaron assembled the community in front of the rock, where he said to them, Listen to me, you rebels! Are we to bring water for you out of this rock? Then, raising his hand, Moses struck the rock twice with his staff, and water gushed out in abundance for the community and their livestock to drink. But the Lord said to Moses and Aaron, Because you were not faithful to Me in showing forth My sanctity before the Israelites, you shall not lead this community into the land I will give them. These are the waters of Meriba, where the Israelites contended against the Lord, and where He revealed His sanctity among them. In God my heart trusts, and I find help; then my heart exults, and with my song I give Him thanks. V. To You, O Lord, I call; O my God, be not deaf to me, do not abandon me. O Lord, deal with us not according to our sins, nor requite us according to our crimes. V. Ps. 78:8-9 O Lord, remember not against us the iniquities of the past; may Your compassion quickly come to us, for we are brought very low. kneel V. Help us, O God, our Savior, because of the glory of Your Name, O Lord; deliver us and pardon our sins for Your Name’s sake. At that time, Jesus came, accordingly, to a town of Samaria called Sichar, near the field that Jacob gave to his son Joseph. Now Jacob’s well was there. Jesus therefore, wearied as He was from the journey, was sitting at the well. It was about the sixth hour. There came a Samaritan woman to draw water. 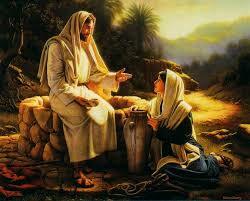 Jesus said to her, Give Me to drink; for His disciples had gone away into the town to buy food. The Samaritan woman therefore said to Him, How is it that You, although You are a Jew, ask drink of me, who am a Samaritan woman? For Jews do not associate with Samaritans. Jesus answered and said to her, If you did know the gift of God, and Who it is Who says to you, ‘Give Me to drink,’ you, perhaps, would have asked of Him, and He would have given you living water. The woman said to Him, Sir, You have nothing to draw with, and the well is deep. Whence then have You living water? Are You greater than our father Jacob who gave us the well, and drank from it, himself, and his sons, and his flocks? In answer Jesus said to her, Everyone who drinks of this water will thirst again. He, however, who drinks of the water that I will give him shall never thirst; but the water that I will give him shall become in him a fountain of water, springing up unto life everlasting. The woman said to Him, Sir, give me this water that I may not thirst, or come here to draw. Jesus said to her, Go, call your husband and come here. The woman answered and said, I have said well, ‘I have no husband.’ for you have had five husbands, and he whom you now have is not your husband. In this you have spoken truly. The woman said to Him, Sir, I see that You are a prophet. Our fathers worshipped on this mountain, but You say that at Jerusalem is the place where one ought to worship. Jesus said to her, Woman, believe Me, the hour is coming when neither on this mountain nor in Jerusalem will you worship the Father. You worship what you do not know; we worship what we know, for salvation is from the Jews. But the hour is coming, and is now here, when the true worshippers will worship the Father in spirit and in truth. For the Father also seeks such to worship Him. God is spirit, and they who worship Him must worship in spirit and in truth. The woman said to Him, I know that Messias is coming Who is called Christ, and when He comes He will tell us all things. Jesus said to her, I Who speak with you am He. And at this point His disciples came; and they wondered that He was speaking with a woman. Yet no one said, What do You seek? or, Why do You speak with her? The woman therefore left her water-jar and went away into the town, and said to the people, Come and see a man who has told me all that I have ever done. Can He be the Christ? They went forth from the town and came to meet Him. Meanwhile, His disciples besought Him, saying, Rabbi, eat. But He said to them, I have food to eat of which you do not know. The disciples therefore said to one another, Has someone brought Him something to eat? Jesus said to them, My food is to do the will of Him Who sent Me, to accomplish His work. Do you not say, ‘There are yet four months, and then comes the harvest’? Well, I say to you, lift up your eyes and behold that the fields are already white for the harvest. And he who reaps receives a wage, and gathers fruit unto life everlasting, so that the sower and the reaper may rejoice together. For herein is the proverb true, ‘One sows, another reaps.’ I have sent you to reap that on which you have not labored. Others have labored, and you have entered into their labors. Now many of the Samaritans of that town believed in Him because of the word of the woman who bore witness, He told me all that I have ever done. When, therefore, the Samaritans had come to Him, they besought Him to stay there; and He stayed two days. And far more believed because of His word. And they said to the woman, We no longer believe because of what you have said, for we have heard for ourselves and we know that this is in truth the Savior of the world. Heed my call for help, my King, and my God! To You I pray, O Lord. Look with favor, we beseech You, O Lord, upon the gifts we offer You, that they may be pleasing to you and ever helpful to our salvation. Through our Lord Jesus Christ Thy Son. Who liveth and reigneth with Thee in the unity of the Holy Ghost, one God Forever and ever. R.Amen. He who drinks of the water that I will give him, says the Lord, it shall become in him a fountain of water, springing up unto life everlasting. May the reception of this sacrament, O Lord, cleanse us from sin and bring us into the heavenly kingdom. Through our Lord Jesus Christ, Who livest and reignest, with God the Father, in the unity of the Holy Ghost, one God For ever and ever. R. Amen. Grant, we beseech You, almighty God, that we who trust in Your protection may, by Your assistance, triumph over all adversities. Through our Lord Jesus Christ, Who livest and reignest, with God the Father, in the unity of the Holy Ghost, one God For ever and ever. R. Amen.